THE man who stole a London Marathon runner's number after he collapsed towards the end of the race went on to steal his narrowboat. 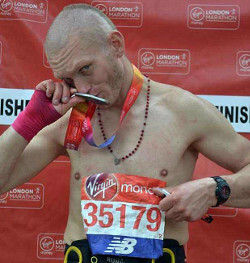 A week after homeless man Stanley Skupien (pictured) was arrested after stealing a London Marathon runner's medal and his number off a collapsed competitor near the finish line, he went on to steal the man's narrowboat, Alan Tilbury reports. 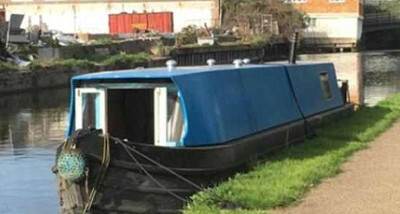 The runner, Lawrence O'Connor, went to his moorings on the Grand Union Canal to discover that his liveaboard narrowboat had gone, so reported it stolen. He was later told that someone was painting a blue narrowboat black near Harlesden, then found Skupien living in his narrowboat even wearing the owner's own clothes three miles up the waterway moored off-side it being painted in an attempt to disguise it, with the London Marathon 'finisher' top draped over the tiller. The stunned boat owner immediately called the police on seeing the man on his boat, but Skupien denied stealing the boat, telling officers he had been asked to paint it for a mystery man who had vanished! He was unable to explain why he was wearing the owner's clothes or why the boat had been taken from its mooring, and the police believed him! Even when the owner later protested he was informed the case was closed. "Called 999. Police arrived but not madly interested in investigating the guy's story that 'some man asked' him to paint, nor in the fact that he dropped a large axe overboard as they approached, nor that the boat had been covered with tarpaulins and distinguishing features attempted be covered-up/removed. "Engine kaput for the time being, with its abductors having put petrol in the diesel and dismantled the air intake. "The officers on the scene said that they believed his story that someone found him sleeping rough and offered him money to paint the boat and they weren't able to prove his story is not true. "Leaves many questions unanswered and is very strange. I insisted they take action to find whoever was behind the theft. "I received an email this morning saying the case is closed and no further action will be taken." So it seems if your boat is stolen, there is not much point in reporting it if the police are going to believe the thief. Lawrence has his boat back and is busy sorting out the mess that the man left it in.